Percutaneous nephrolithotomy (PCNL) is a common urological procedure for the treatment of complicated upper urinary tract stone disease. It offers the advantages of lower morbidity and mortality rates, faster recovery, easier secondary procedures, and greater cost-effectiveness compared to open urinary stone surgery. Placement of a nephrostomy tube after the completion of the stone extraction has been a standard procedure following PCNL to promote better hemostasis, adequate drainage, and the maintenance of an access tract for a secondary view. However, the necessity for an indwelling nephrostomy tube after PCNL has been challenged in recent years. Tubeless PCNL was first reported in 1997 by Bellman et al., it has become a well-accepted alternative modification for percutaneous renal surgery., In 2008, Agrawal et al. reported a randomized study of tubeless PCNL comparing with standard PCNL in 202 patients to evaluate the safety and efficacy of tubeless PCNL. Compared to traditional standard PCNL, they demonstrated that tubeless PCNL was associated with less postoperative urinary leakage, reduced local pain, and shorter hospital stay without an increase in postoperative morbidity. Several studies have demonstrated the benefits of tubeless PCNL, including a decrease in the length of hospital stay, an early return to normal activities, and reduced analgesic requirements without an increase in morbidity. Hemorrhage is a common and bothersome complication after PCNL, especially for the tubeless modification which does not have the tamponade effect of the nephrostomy tube. To diminish hemorrhagic complications after tubeless PCNL, instillation of fibrin sealants and various hemostatic agents to seal the access tract have been reported by several authors.,, The applications of fibrin sealants and hemostatic agents have been demonstrated to improve hemostasis, decrease the incidence of urine leakage, and reduce analgesic requirements. However, the most appropriate way to prevent postoperative hemorrhage after tubeless PCNL is not established yet at present. Direct pressure compression on bleeding vessels is one of the most basic and effective methods to achieve adequate hemostasis. To achieve compression force on the access tract, the Kaye nephrostomy tamponade catheter has been developed to achieve hemostasis to control intraoperative bleeding. In order to improve hemorrhage control for tubeless PCNL after stone extraction, we packed the renal access tract with oxidized regenerated cellulose (Surgicel™) strips and then applied compression force on the renal access tract. Here, we retrospectively reviewed the clinical results of the first consecutive 216 patients who underwent this procedure at our hospital. From April 2013 to June 2014, 216 consecutive tubeless PCNL procedures were performed at our hospital with postoperative access tract compression by the same well-experienced urologic team. The clinical results of these patients were analyzed by retrospective chart review. The indications for PCNL included a large urinary renal stone burden, calyceal stones, abnormal urinary tract anatomy, the failure of extracorporeal shock wave lithotripsy, and upper urinary tract stones ever treated by ureteroscopy with failure. All PCNLs were performed by standardized operative procedures with a single access tract in the prone position. Blood transfusion was given in patients whose hemoglobin level fell below 10 g/dL before the operation, and all patients were determined to have a hemoglobin level >10 g/dL at the time of operation. Before renal puncture, an occlusion balloon catheter was inserted cystoscopically in the supine lithotomy position for retrograde saline infusion and to prevent the downward migration of stone fragments. The renal access tract was obtained through puncture with an 18-gauge needle under ultrasound guidance. A 0.038-inch J-tip wire was then inserted and the access tract was dilated with serial coaxial metal dilators to allow the passage of a 24F nephroscope. Holmium: yttrium-aluminum-garnet laser and pneumatic lithotripter were used alone or in combination for stone disintegration. A 7F double-J catheter was inserted antegradely after the completion of stone extraction. The irrigant was then changed from normal saline to distilled water. The bleeding points within the collection system and renal access tract were cauterized with an elongated electrode probe attached to the handpiece of a conventional electric cauterizer. After access tract cauterization, an 8F Foley catheter was inserted into the collection system through the working sheath, then inflated with 3 ml to 5 ml of sterile water and was slightly retracted to obliterate the inner opening of the access tract under direct vision nephroscopically. Then, we tied the Foley catheter beneath the bifurcation and removed the bifurcation part of the Foley catheter to preserve water in the balloon and to allow the insertion of the inner working sheath through the Foley catheter for further compression. The working sheath was withdrawn to the level of the renal capsule and the access tract of the renal parenchyma was packed with Surgicel™ through the nephroscope. The Surgicel™ strips were compacted with smaller dilators through the working sheath. After 5 min of compression, the Foley catheter was deflated and removed, leaving the Surgicel™ plug in the renal parenchyma. A bloodless tract usually was achieved in these patients [Figure 1]. Then, the wound was closed with nylon suture. “Stone-free” was defined as complete removal of all stones as evaluated by a postoperative kidney, ureter, and bladder (KUB) film or computerized tomography. Hemoglobin level was checked in patients experienced severe bleeding during or after the operation, blood transfusion was given in patients have their hemoglobin level <10 g/dL or patients with unstable vital signs. 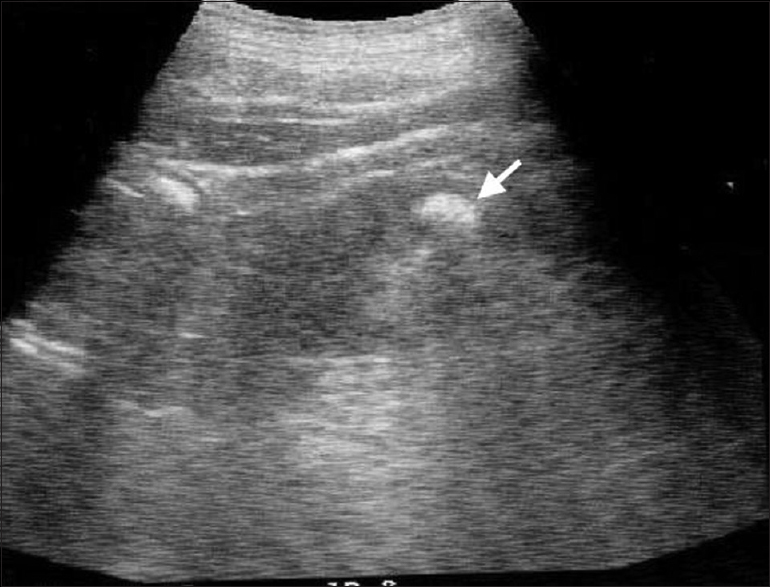 Renal ultrasound was performed in each patient 1–2 weeks after the operation. Clinical data concerning patients' age, stone size, operation time, length of postoperative hospital stay, infection rate, and transfusion rate were analyzed by postoperative chart review. Of the 216 patients, 139 are male and 77 are female and the ages ranged from 26 to 82 years (mean 56.0 ± 11.7 years). 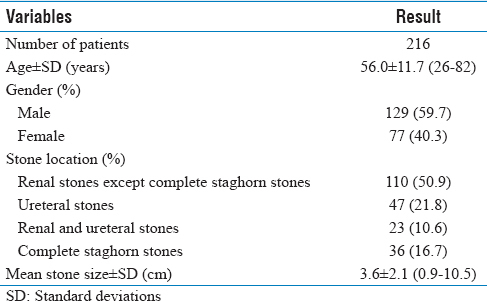 The characteristics of the stones treated in this study included renal stones in 146 patients (including 36 patients with staghorn stones), ureteral stones in 47 patients, and kidney plus ureteral stones in 23 patients. The stone size was measured on a preoperative KUB radiography film (or from computerized tomography in patients with radiolucent stones) using the longest diameter. The average stone size was 3.6 ± 2.1 cm (range 0.9–10.5 cm). The demographic data and preoperative stone characteristics were summarized in [Table 1]. The operation time was estimated from the beginning of cystoscopy for the insertion of the occlusion balloon catheter to the end of the wound closure. The average operation time was 80.5 ± 30.1 min (range 30–200 min). The target stones were removed in all patients and the overall stone-free rate was 73.6%. The postoperative blood transfusion rate was 1.4% (three patients), and no patients underwent angiographic intervention or other procedures for the treatment of hemorrhagic complications. The change of hemoglobin was not recorded in the current report due to retrospective study and postoperative hemoglobin test was not routinely performed in our practice. As a result, postoperative follow-up of serum hemoglobin is not a regular routine in our hospital. Postoperative spiking fever with body temperature elevation >38.5°C without evidence of any other source of infection was considered to be a urinary tract infection. 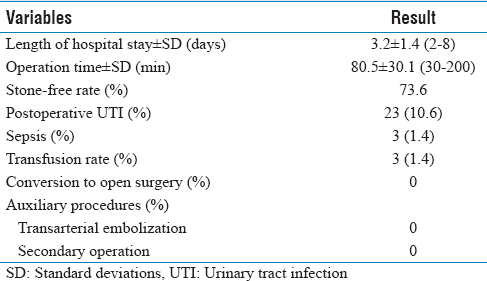 Postoperative urinary tract infection was noted in 23 patients (10.6%), among them sepsis was noted in three patients (1.4%); all of these patients recovered well after proper antibiotic treatments. There was no pulmonary complication in this study. The average postoperative hospital stay was 3.2 ± 1.4 days (range 2–8 days). There was no conversion to open surgery in this series. No patient received a secondary procedure or operation due to surgery-related complications. The peri- and postoperative outcomes were revealed in [Table 2]. No dislodgement of the Surgicel™ plug, perirenal hematoma, or urinoma formation was noted by postoperative ultrasound survey [Figure 2]. One of the purposes of indwelling nephrostomy tube after percutaneous renal surgery is to obtain tract compression for hemostasis. Without the tamponade effect of the nephrostomy tube, troublesome postoperative tract hemorrhage may be a nightmare for the operators and patients. Patient's safety should always be the first consideration and adequate hemorrhage control is a crucial task in tubeless percutaneous renal surgery. To obtain better hemostasis and to improve the efficacy of tubeless PCNL, researchers have reported insertion of various sealants and hemostasis agents in the renal parenchymal defects. In 2004, Noller et al. first reported their clinical experience of using fibrin sealant at the renal parenchymal defect to facilitate nephrostomy tube free PCNL in 10 renal units. Following percutaneous stone clearance, the fibrin sealant was injected through an 18-gauge spinal needle into the renal parenchyma between the collecting system and the renal capsule. The authors therefore advocated tubeless PCNL using fibrin sealant at the renal parenchymal defect and suggested that the approach appeared to be safe and feasible. A prospective, randomized study evaluating the safety and efficacy of fibrin sealant in tubeless PCNL was reported by Shah et al. in 2006; they found that instillation of fibrin glue was associated with less postoperative pain and lower analgesic requirements. Other hemostasis materials such as absorbable gelatin and Surgicel™, which are less expensive than fibrin sealant, have also been used to seal the access tract during tubeless PCNL. In 2006, Yu packed the nephrostomy cortical tract with a gelatin patch under nephroscopic vision to prevent hemorrhage and urine leakage in 15 patients. Singh et al. prospectively evaluated the use of a gelatin tissue hemosealant for tubeless PCNL in 50 patients. They reported less pain, lower analgesia requirements, less urine leakage, and shorter hospital stay in patients in the gelatin-assisted tubeless PCNL group. In a randomized study of 20 tubeless PNL patients reported by Aghamir et al. in 2006, Surgicel™ has been used to seal the nephrostomy tract after tubeless PCNL in 10 patients. The authors claimed that bleeding or extravasation from the nephrostomy tract treated with Surgicel™ after totally tubeless PCNL did not decrease, but the sample size was limited in this study. The authors suggested that a larger sample size is mandatory to evaluate the effect of Surgicel™. In our study, we applied pressure to the access tract using an 8F inflated Foley catheter, Surgicel™ plug and small dilators through the working sheath to achieve more effective hemostasis and a low postoperative blood transfusion rate (1.4%) in 216 patients. In contemporary studies, the blood transfusion rates after receiving tubeless PCNL are about 3.4% to 9.1%.,,,, The innovative way in Surgicel™ use definitely decreased the postoperative blood transfusion rate. In our hospital, it mitigated the blood transfusion rate from 2.5% to 1.4% with the same tubeless PCNL procedures except for Surgicel™ use., The alteration of hemoglobin is also one of the means to measure blood loss during tubeless PCNL. Nevertheless, the hemoglobin level was not collected after tubeless PCNL in our hospital because it was not a regular routine which was based on the quite low transfusion rate. The postoperative hospital stays in this study (3.2 days) were longer than those in other reported series concerning tubeless PCNL which were usually <2 days., It is because the National Health Insurance System in Taiwan managed by the government covers most of the medical fees. Thus, patients in Taiwan prefer to stay in the hospital until they feel completely well. However, the postoperative hospital stay in this study is similar to that of another tubeless PCNL report from Taiwan (3.4 days). There are some limitations of this study including the retrospective nature and lack of control study. The shift of serum hemoglobin is also a reliable tool to evaluate the facility of Surgicel™ but not applied in the current study. Further comparative and prospective studies are needed to confirm the efficacy of this procedure. There are many techniques for improving hemostasis during tubeless PCNL and we introduce a new technique for hemostasis of access tract with Surgicel™. In this study, we utilized a new scheme for pressure hemostasis to mitigate access tract bleeding, and our results suggest that Surgicel™ pressure compression may be an alternative method to minimize hemorrhagic complications during tubeless PCNL. We would like to thank Ms. Fang-Chun Kuo for completing the article illustration. Bellman GC, Davidoff R, Candela J, Gerspach J, Kurtz S, Stout L, et al. Tubeless percutaneous renal surgery. J Urol 1997;157:1578-82. Lai WH, Jou YC, Cheng MC, Shen CH, Lin CT, Chen PC, et al. Tubeless percutaneous nephrolithotomy: Experience of 1000 cases at a single institute. Urol Sci 2017;28:23-6. Agrawal MS, Agrawal M, Gupta A, Bansal S, Yadav A, Goyal J, et al. A randomized comparison of tubeless and standard percutaneous nephrolithotomy. J Endourol 2008;22:439-42. Zhong Q, Zheng C, Mo J, Piao Y, Zhou Y, Jiang Q, et al. Total tubeless versus standard percutaneous nephrolithotomy: A meta-analysis. J Endourol 2013;27:420-6. Noller MW, Baughman SM, Morey AF, Auge BK. Fibrin sealant enables tubeless percutaneous stone surgery. J Urol 2004;172:166-9. Lee DI, Uribe C, Eichel L, Khonsari S, Basillote J, Park HK, et al. Sealing percutaneous nephrolithotomy tracts with gelatin matrix hemostatic sealant: Initial clinical use. J Urol 2004;171:575-8. Aghamir SM, Khazaeli MH, Meisami A. Use of surgicel for sealing nephrostomy tract after totally tubeless percutaneous nephrolithotomy. J Endourol 2006;20:293-5. Abbott JE, Cicic A, Jump RW 3rd, Davalos JG. Hemostatic plug: Novel technique for closure of percutaneous nephrostomy tract. J Endourol 2015;29:263-9. Kaye KW, Clayman RV. Tamponade nephrostomy catheter for percutaneous nephrostolithotomy. Urology 1986;27:441-5. Feng MI, Tamaddon K, Mikhail A, Kaptein JS, Bellman GC. Prospective randomized study of various techniques of percutaneous nephrolithotomy. Urology 2001;58:345-50. Shah HN, Hegde S, Shah JN, Mohile PD, Yuvaraja TB, Bansal MB, et al. A prospective, randomized trial evaluating the safety and efficacy of fibrin sealant in tubeless percutaneous nephrolithotomy. J Urol 2006;176:2488-92. Yu DS. Gelatin packing of intracortical tract after percutaneous nephrostomy lithotripsy for decreasing bleeding and urine leakage. J Chin Med Assoc 2006;69:162-5. Singh I, Saran RN, Jain M. Does sealing of the tract with absorbable gelatin (Spongostan) facilitate tubeless PCNL? A prospective study. J Endourol 2008;22:2485-93. Bhat S, Lal J, Paul F. A randomized controlled study comparing the standard, tubeless, and totally tubeless percutaneous nephrolithotomy procedures for renal stones from a tertiary care hospital. Indian J Urol 2017;33:310-4. Rizvi SA, Hussain M, Askari SH, Hashmi A, Lal M, Zafar MN, et al. Surgical outcomes of percutaneous nephrolithotomy in 3402 patients and results of stone analysis in 1559 patients. BJU Int 2017;120:702-9. Chung HS, Jung SI, Yu HS, Hwang EC, Oh KJ, Kwon DD, et al. Modified totally tubeless percutaneous nephrolithotomy: Is it an effective and safe treatment option for renal and upper ureteral stones? Wideochir Inne Tech Maloinwazyjne 2016;11:240-6. Moosanejad N, Firouzian A, Hashemi SA, Bahari M, Fazli M. Comparison of totally tubeless percutaneous nephrolithotomy and standard percutaneous nephrolithotomy for kidney stones: A randomized, clinical trial. Braz J Med Biol Res 2016;49:e4878. Shen CH, Cheng MC, Lin CT, Jou YC, Chen PC. Innovative metal dilators for percutaneous nephrostomy tract: Report on 546 cases. Urology 2007;70:418-21. Chang CH, Wang CJ, Huang SW. Totally tubeless percutaneous nephrolithotomy: A prospective randomized controlled study. Urol Res 2011;39:459-65.